Inhabited for more than 7 millennia, Athens is a vibrant modern capital filled with some of the world’s most celebrated sites of antiquity. After breakfast, your walking tour will transport you to the ancient days of Greece. With insight from General Tours expert guide, you’ll learn about these early days of Western Civilization as you explore landmarks like the Monument of Lysicrates, erected in 334 BC, the Theater of Dionysus and the magnificent Odeon of Herodes Atticus. Ascending the fabled Acropolis in the center of Athens, you’ll behold world-famous monuments including the Parthenon and the Erechtheion with its famous statues of six maidens known as Caryatids. Then tour the Acropolis Museum with its outstanding collection of sculpture and artifacts from the ancient citadel. In the afternoon, your sightseeing continues in the Agora, the commercial and civic center of ancient Athens. Standing it the large open square that comprises the heart of this amazing archaeological site, you’ll gain deeper insight into the daily life, culture and politics of classical Greece. This evening’s dinner of traditional Greek dishes includes a lively culinary demonstration. Steeped in myth and legend, the ancient Mycenaean city of Iolkos was famed as the birthplace of Jason, the leader of the Argonauts who journeyed to the shores of the Black Sea to secure the fabled Golden Fleece. Today, the lively university town and port of Volos stand close to this ancient site. Descending from Portaria this morning, you’ll travel down to the shores of the Pagasetic Gulf to explore the archaeological sites that surround Volos. At Sesklo, you’ll see the ancient remains of a Neolithic settlement that flourished more than 7,000 years ago. Not far away, the excavations at Dimini have shed much light on Neolithic life in the 5th millennium B.C. 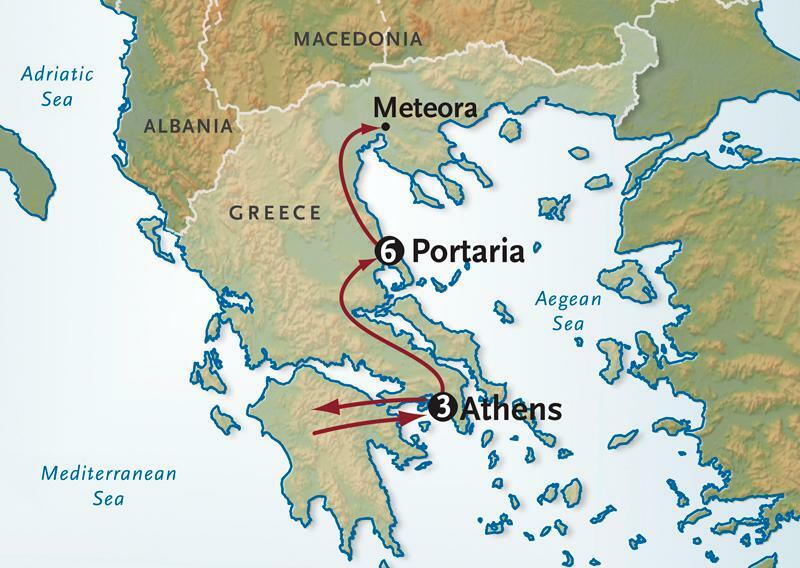 ; scholars also believe that this was the ancient settlement that eventually grew into the Mycenaean town of Iolkos. Your last stop of the morning will be along the coast at Nea Anchialos; regarded as one of the country’s most important Early Christian sites, your exploration of its archaeological excavations will include the remains of nine ancient basilicas.